Charlotte Quilts and Bedding from VHC Brands | P.C. Fallon Co. The Charlotte collection reflects European charm in its simplicity with a solid color quilt matched with accessories accented with minimal provincial stripes in either azure blue, rouge red, or slate grey. Window treatments are also offered in a solid neutral for an understated look. The whole-cloth quilt is made of a luxurious blend of linen and cotton (Belgium linen weight – 50% cotton, 50% linen) on the face in a grey/beige color, reversing to a natural shade ultra-soft cotton voile on the back. Generous hand-quilting provides heirloom quality, with on-point square diamond and echo hand-quilting in the center and channel hand-quilting around the perimeter. 100% Cotton batting. The shams are diamond quilted on the face with mitered stencil stripes at the border and reverse to a natural shade ultra-soft cotton voile on the back with 3 button closures. The ruffled euro sham, bedskirt, and window treatments feature a pencil stripe in one of the three colors. A set of pillowcases and a throw pillow are accented with grain sack stripes. Striped rugs in a natural cotton rib weave, with a back latex layer to reduce slippage, add a finishing touch at your feet. This versatile collection offers many decorating options with its neutral background and subtle color choices that also work well with other prints and solids. These items are imported. Please note, colors may appear differently in different resolutions and on different computers. Machine wash, gentle cycle. Made by VHC Brands. The Charlotte Twin Quilt reflects European charm in its simplicity. The whole-cloth quilt is made of a luxurious blend of linen and cotton (Belgium linen weight – 50% cotton, 50% linen) on the face in a grey/beige color, reversing to a natural shade ultra-soft cotton voile on the back. Generous hand-quilting provides heirloom quality, with on-point square diamond and echo hand-quilting in the center and channel hand-quilting around the perimeter. Measures 90"L x 70"W. 100% Cotton batting. This item is imported. Please note, colors may appear differently in different resolutions and on different computers. Machine wash, gentle cycle. Made by VHC Brands. Manufacturer's UPC code is 840528124594. The Charlotte Queen Quilt reflects European charm in its simplicity. The whole-cloth quilt is made of a luxurious blend of linen and cotton (Belgium linen weight – 50% cotton, 50% linen) on the face in a grey/beige color, reversing to a natural shade ultra-soft cotton voile on the back. Generous hand-quilting provides heirloom quality, with on-point square diamond and echo hand-quilting in the center and channel hand-quilting around the perimeter. Measures 94" x 94". 100% Cotton batting. This item is imported. Please note, colors may appear differently in different resolutions and on different computers. Machine wash, gentle cycle. Made by VHC Brands. Manufacturer's UPC code is 840528124587. The Charlotte King Quilt reflects European charm in its simplicity. The whole-cloth quilt is made of a luxurious blend of linen and cotton (Belgium linen weight – 50% cotton, 50% linen) on the face in a grey/beige color, reversing to a natural shade ultra-soft cotton voile on the back. Generous hand-quilting provides heirloom quality, with on-point square diamond and echo hand-quilting in the center and channel hand-quilting around the perimeter. Measures 97"L x 110"W. 100% Cotton batting. This item is imported. Please note, colors may appear differently in different resolutions and on different computers. Machine wash, gentle cycle. Made by VHC Brands. Manufacturer's UPC code is 840528124570. The Charlotte Luxury King Quilt reflects European charm in its simplicity. The whole-cloth quilt is made of a luxurious blend of linen and cotton (Belgium linen weight – 50% cotton, 50% linen) on the face in a grey/beige color, reversing to a natural shade ultra-soft cotton voile on the back. Generous hand-quilting provides heirloom quality, with on-point square diamond and echo hand-quilting in the center and channel hand-quilting around the perimeter. Measures 105"L x 120"W. 100% Cotton batting. This item is imported. Please note, colors may appear differently in different resolutions and on different computers. Machine wash, gentle cycle. Made by VHC Brands. Manufacturer's UPC code is 840528124563. The Charlotte Azure Standard Sham reflects European charm in its simplicity. The sham has on-point diamond hand-quilting on a luxurious blend of linen and cotton (Belgium linen weight – 50% cotton, 50% linen) in a grey/beige color. An azure blue stencil border with mitered edges adds a classic, elegant look. The sham reverses to a natural shade ultra-soft cotton voile on the back with 3 button closures and 3" overlap. 100% cotton batting. Straight edge with self binding trim. Measures 21" x 27". This item is imported. Please note, colors may appear differently in different resolutions and on different computers. Made by VHC Brands. Manufacturer's UPC code is 840528125003. The Charlotte Rouge Standard Sham reflects European charm in its simplicity. The sham has on-point diamond hand-quilting on a luxurious blend of linen and cotton (Belgium linen weight – 50% cotton, 50% linen) in a grey/beige color. A rouge red stencil border with mitered edges adds a classic, elegant look. The sham reverses to a natural shade ultra-soft cotton voile on the back with 3 button closures and 3" overlap. 100% cotton batting. Straight edge with self binding trim. Measures 21" x 27". This item is imported. Please note, colors may appear differently in different resolutions and on different computers. Made by VHC Brands. Manufacturer's UPC code is 840528124600. The Charlotte Slate Standard Sham reflects European charm in its simplicity. 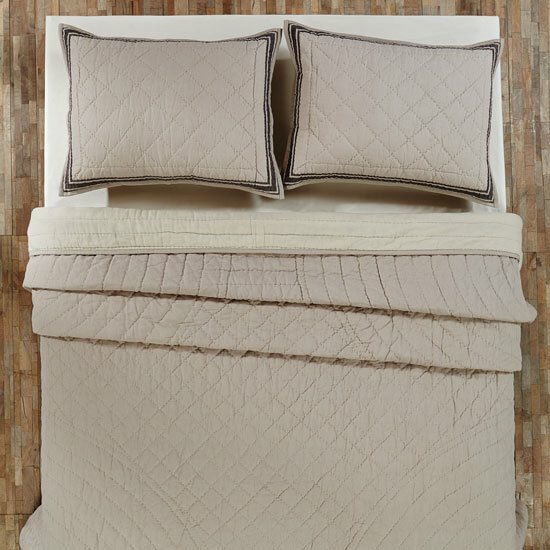 The sham has on-point diamond hand-quilting on a luxurious blend of linen and cotton (Belgium linen weight – 50% cotton, 50% linen) in a grey/beige color. A slate grey stencil border with mitered edges adds a classic, elegant look. The sham reverses to a natural shade ultra-soft cotton voile on the back with 3 button closures and 3" overlap. 100% cotton batting. Straight edge with self binding trim. Measures 21" x 27". This item is imported. Please note, colors may appear differently in different resolutions and on different computers. Made by VHC Brands. Manufacturer's UPC code is 840528124808. The Charlotte Azure King Sham reflects European charm in its simplicity. The sham has on-point diamond hand-quilting on a luxurious blend of linen and cotton (Belgium linen weight – 50% cotton, 50% linen) in a grey/beige color. An azure blue stencil border with mitered edges adds a classic, elegant look. The sham reverses to a natural shade ultra-soft cotton voile on the back with 3 button closures and 3" overlap. 100% cotton batting. Straight edge with self binding trim. Measures 21" x 37". This item is imported. Please note, colors may appear differently in different resolutions and on different computers. Made by VHC Brands. Manufacturer's UPC code is 840528125010. The Charlotte Slate King Sham reflects European charm in its simplicity. The sham has on-point diamond hand-quilting on a luxurious blend of linen and cotton (Belgium linen weight – 50% cotton, 50% linen) in a grey/beige color. A slate grey stencil border with mitered edges adds a classic, elegant look. The sham reverses to a natural shade ultra-soft cotton voile on the back with 3 button closures and 3" overlap. 100% cotton batting. Straight edge with self binding trim. Measures 21" x 37". This item is imported. Please note, colors may appear differently in different resolutions and on different computers. Made by VHC Brands. Manufacturer's UPC code is 840528124815. The Charlotte Azure Fabric Euro Sham reflects European charm in its simplicity. The euro sham is made of a luxurious blend of linen and cotton (Belgium linen weight – 50% cotton, 50% linen) on the face in an azure blue pencil stripe print. Trimmed with 1.5" ruffle in the stripe. On the back is a natural shade ultra-soft cotton voile with 3 button closures. Measures 26" x 26". Designed to be used behind a standard sham. This item is imported. Please note, colors may appear differently in different resolutions and on different computers. Made by VHC Brands. Manufacturer's UPC code is 840528125027. The Charlotte Azure Twin Bed Skirt reflects European charm in its simplicity. The tailored bedskirt is made of a luxurious blend of linen and cotton (Belgium linen weight – 50% cotton, 50% linen) in an azure blue pencil stripe print. Measures 39"W x 76"L with a 16" drop. Flat panel skirt finished with split corners. White cotton deck trimmed on three sides with 3" fabric strip matching ruffle to conceal white fabric from view. This item is imported. Please note, colors may appear differently in different resolutions and on different computers. Made by VHC Brands. Manufacturer's UPC code is 840528125072. The Charlotte Rouge Twin Bed Skirt reflects European charm in its simplicity. The tailored bedskirt is made of a luxurious blend of linen and cotton (Belgium linen weight – 50% cotton, 50% linen) in a rouge red pencil stripe print. Measures 39"W x 76"L with a 16" drop. Flat panel skirt finished with split corners. White cotton deck trimmed on three sides with 3" fabric strip matching ruffle to conceal white fabric from view. This item is imported. Please note, colors may appear differently in different resolutions and on different computers. Made by VHC Brands. Manufacturer's UPC code is 840528124679. The Charlotte Slate Twin Bed Skirt reflects European charm in its simplicity. The tailored bedskirt is made of a luxurious blend of linen and cotton (Belgium linen weight – 50% cotton, 50% linen) in a slate grey pencil stripe print. Measures 39"W x 76"L with a 16" drop. Flat panel skirt finished with split corners. White cotton deck trimmed on three sides with 3" fabric strip matching ruffle to conceal white fabric from view. This item is imported. Please note, colors may appear differently in different resolutions and on different computers. Made by VHC Brands. Manufacturer's UPC code is 840528124877. The Charlotte Azure Queen Bed Skirt reflects European charm in its simplicity. The tailored bedskirt is made of a luxurious blend of linen and cotton (Belgium linen weight – 50% cotton, 50% linen) in an azure blue pencil stripe print. Measures 60"W x 80"L with a 16" drop. Flat panel skirt finished with split corners. White cotton deck trimmed on three sides with 3" fabric strip matching ruffle to conceal white fabric from view. This item is imported. Please note, colors may appear differently in different resolutions and on different computers. Made by VHC Brands. Manufacturer's UPC code is 840528125065. The Charlotte Rouge Queen Bed Skirt reflects European charm in its simplicity. The tailored bedskirt is made of a luxurious blend of linen and cotton (Belgium linen weight – 50% cotton, 50% linen) in a rouge red pencil stripe print. Measures 60"W x 80"L with a 16" drop. Flat panel skirt finished with split corners. White cotton deck trimmed on three sides with 3" fabric strip matching ruffle to conceal white fabric from view. This item is imported. Please note, colors may appear differently in different resolutions and on different computers. Made by VHC Brands. Manufacturer's UPC code is 840528124662. The Charlotte Slate Queen Bed Skirt reflects European charm in its simplicity. The tailored bedskirt is made of a luxurious blend of linen and cotton (Belgium linen weight – 50% cotton, 50% linen) in a slate grey pencil stripe print. Measures 60"W x 80"L with a 16" drop. Flat panel skirt finished with split corners. White cotton deck trimmed on three sides with 3" fabric strip matching ruffle to conceal white fabric from view. This item is imported. Please note, colors may appear differently in different resolutions and on different computers. Made by VHC Brands. Manufacturer's UPC code is 840528124860. The Charlotte Azure King Bed Skirt reflects European charm in its simplicity. The tailored bedskirt is made of a luxurious blend of linen and cotton (Belgium linen weight – 50% cotton, 50% linen) in an azure blue pencil stripe print. Measures 78"W x 80"L with a 16" drop. Flat panel skirt finished with split corners. White cotton deck trimmed on three sides with 3" fabric strip matching ruffle to conceal white fabric from view. This item is imported. Please note, colors may appear differently in different resolutions and on different computers. Made by VHC Brands. Manufacturer's UPC code is 840528125058. The Charlotte Rouge King Bed Skirt reflects European charm in its simplicity. The tailored bedskirt is made of a luxurious blend of linen and cotton (Belgium linen weight – 50% cotton, 50% linen) in a rouge red pencil stripe print. Measures 78"W x 80"L with a 16" drop. Flat panel skirt finished with split corners. White cotton deck trimmed on three sides with 3" fabric strip matching ruffle to conceal white fabric from view. This item is imported. Please note, colors may appear differently in different resolutions and on different computers. Made by VHC Brands. Manufacturer's UPC code is 840528124655. The Charlotte Slate King Bed Skirt reflects European charm in its simplicity. The tailored bedskirt is made of a luxurious blend of linen and cotton (Belgium linen weight – 50% cotton, 50% linen) in a slate grey pencil stripe print. Measures 78"W x 80"L with a 16" drop. Flat panel skirt finished with split corners. White cotton deck trimmed on three sides with 3" fabric strip matching ruffle to conceal white fabric from view. This item is imported. Please note, colors may appear differently in different resolutions and on different computers. Made by VHC Brands. Manufacturer's UPC code is 840528124853. The Charlotte Azure Pillow reflects European charm in its simplicity with two stenciled azure blue grain sack stripes on a luxurious blend of linen/cotton (Belgium linen weight – 50% cotton, 50% linen). Reverses to a natural shade ultra-soft cotton voile on the back with two button closures and 3" overlap to conceal included pillow insert. Turned edge seam. Measures 16" x 16". Coordinates easily with other bed ensembles. This item is imported. Please note, colors may appear differently in different resolutions and on different computers. Made by VHC Brands. Manufacturer's UPC code is 840528152160. The Charlotte Slate Pillow and Insert reflects European charm in its simplicity with two stenciled slate grey grain sack stripes on a luxurious blend of linen/cotton (Belgium linen weight – 50% cotton, 50% linen). Reverses to a natural shade ultra-soft cotton voile on the back with two button closures and 3" overlap to conceal included pillow insert. Turned edge seam. Measures 16" x 16". Coordinates easily with other bed ensembles. This item is imported. Please note, colors may appear differently in different resolutions and on different computers. Made by VHC Brands. Manufacturer's UPC code is 840528152962. The Charlotte Azure Pillow Case Set of 2 reflects European charm in its simplicity with a single printed azure blue grain sack stripe on an ultra-soft cotton voile. Reverses to a natural shade ultra-soft cotton voile on the back. Set of 2 pillowcases. Each measures 21" x 30". Coordinates easily with other bed ensembles. This item is imported. Please note, colors may appear differently in different resolutions and on different computers. Made by VHC Brands. Manufacturer's UPC code is 840528125041. The Charlotte Rouge Pillow Case Set of 2 reflects European charm in its simplicity with a single printed rouge red grain sack stripe on an ultra-soft cotton voile. Reverses to a natural shade ultra-soft cotton voile on the back. Set of 2 pillowcases. Each measures 21" x 30". Coordinates easily with other bed ensembles. This item is imported. Please note, colors may appear differently in different resolutions and on different computers. Made by VHC Brands. Manufacturer's UPC code is 840528124648. The Charlotte Slate Pillow Case Set of 2 reflects European charm in its simplicity with a single printed slate grey grain sack stripe on an ultra-soft cotton voile. Reverses to a natural shade ultra-soft cotton voile on the back. Set of 2 pillowcases. Each measures 21" x 30". Coordinates easily with other bed ensembles. This item is imported. Please note, colors may appear differently in different resolutions and on different computers. Made by VHC Brands. Manufacturer's UPC code is 840528124846. The Charlotte Azure Scalloped Valance has stenciled azure blue pencil stripes printed on a luxurious linen/cotton blend known as “Belgium weight” meaning equal parts cotton and linen in grey/beige. Scalloped hem with bias cut stripe binding trim. Sides are .75" hem fold. Features 2" header and 3.25" rod pocket. Measures 16" x 72". Lined with white cotton. This item is imported. Please note, colors may appear differently in different resolutions and on different computers. Made by VHC Brands. Manufacturer's UPC code is 840528125157. The Charlotte Rouge Scalloped Valance has stenciled rouge red pencil stripes printed on a luxurious linen/cotton blend known as “Belgium weight” meaning equal parts cotton and linen in grey/beige. Scalloped hem with bias cut stripe binding trim. Sides are .75" hem fold. Features 2" header and 3.25" rod pocket. Measures 16" x 72". Lined with white cotton. This item is imported. Please note, colors may appear differently in different resolutions and on different computers. Made by VHC Brands. Manufacturer's UPC code is 840528124754. The Charlotte Slate Scalloped Valance has stenciled slate grey pencil stripes printed on a luxurious linen/cotton blend known as “Belgium weight” meaning equal parts cotton and linen in grey/beige. Scalloped hem with bias cut stripe binding trim. Sides are .75" hem fold. Features 2" header and 3.25" rod pocket. Measures 16" x 72". Lined with white cotton. This item is imported. Please note, colors may appear differently in different resolutions and on different computers. Made by VHC Brands. Manufacturer's UPC code is 840528124952. The Charlotte Solid Natural Scalloped Valance is made of a grey/beige color luxurious linen/cotton blend known as “Belgium weight” meaning equal parts cotton and linen. Scalloped hem with self binding trim. Sides are .75" hem fold. Features 2" header and 3.25" rod pocket. Measures 16" x 72". Lined with white cotton. This item is imported. Please note, colors may appear differently in different resolutions and on different computers. Made by VHC Brands. Manufacturer's UPC code is 840528124556. The Charlotte Slate Scalloped Swag Set of 2 has stenciled slate grey pencil stripes printed on a luxurious linen/cotton blend known as “Belgium weight” meaning equal parts cotton and linen in grey/beige. Scalloped hem with bias cut stripe binding trim. Sides are .75" hem fold. Features 2" header and 3.25" rod pocket. Each panel measures 36" x 36" with a 16" center drop. Lined with white cotton. This item is imported. Please note, colors may appear differently in different resolutions and on different computers. Made by VHC Brands. Manufacturer's UPC code is 840528124921. The Charlotte Solid Natural Scalloped Swag Set of 2 is made of a grey/beige color luxurious linen/cotton blend known as “Belgium weight” meaning equal parts cotton and linen. Scalloped hem with self binding trim. Sides are .75" hem fold. Features 2" header and 3.25" rod pocket. Each panel measures 36" x 36" with a 16" center drop. Lined with white cotton. This item is imported. Please note, colors may appear differently in different resolutions and on different computers. Made by VHC Brands. Manufacturer's UPC code is 840528124525. The Charlotte Azure Scalloped Prairie Swag Set of 2 has stenciled azure blue pencil stripes printed on a luxurious linen/cotton blend known as “Belgium weight” meaning equal parts cotton and linen in grey/beige. Scalloped hem with bias cut stripe binding trim. Sides are .75" hem fold. Features 2" header and 3.25" rod pocket. Drawstring ties. Each panel measures 36" x 36" with an 18" center drop. Lined with white cotton. This item is imported. Please note, colors may appear differently in different resolutions and on different computers. Made by VHC Brands. Manufacturer's UPC code is 840528125119. The Charlotte Rouge Scalloped Prairie Swag Set of 2 has stenciled rouge red pencil stripes printed on a luxurious linen/cotton blend known as “Belgium weight” meaning equal parts cotton and linen in grey/beige. Scalloped hem with bias cut stripe binding trim. Sides are .75" hem fold. Features 2" header and 3.25" rod pocket. Drawstring ties. Each panel measures 36" x 36" with an 18" center drop. Lined with white cotton. This item is imported. Please note, colors may appear differently in different resolutions and on different computers. Made by VHC Brands. Manufacturer's UPC code is 840528124716. The Charlotte Slate Scalloped Prairie Swag Set of 2 is made of a grey/beige color luxurious linen/cotton blend known as “Belgium weight” meaning equal parts cotton and linen. Scalloped hem with self binding trim. Sides are .75" hem fold. Features 2" header and 3.25" rod pocket. Drawstring ties. Each panel measures 36" x 36" with an 18" center drop. Lined with white cotton. This item is imported. Please note, colors may appear differently in different resolutions and on different computers. Made by VHC Brands. Manufacturer's UPC code is 840528124518. The Charlotte Solid Natural Scalloped Prairie Curtain Set of 2 is made of a grey/beige color luxurious linen/cotton blend known as “Belgium weight” meaning equal parts cotton and linen. Scalloped hem with self binding trim. Sides are .75" hem fold. Features 2" header and 3.25" rod pocket. Drawstring ties. Each panel measures 63" x 36" with an 18" center drop. Lined with white cotton. This item is imported. Please note, colors may appear differently in different resolutions and on different computers. Made by VHC Brands. Manufacturer's UPC code is 840528124501. The Charlotte Azure Scalloped Short Panel Set of 2 has stenciled azure blue pencil stripes printed on a luxurious linen/cotton blend known as “Belgium weight” meaning equal parts cotton and linen in grey/beige. Scalloped hem with bias cut stripe binding trim. Sides are .75" hem fold. Features 2" header and 3.25" rod pocket. Includes 2 matching tie-backs. Each panel measures 63" x 36". Lined with white cotton. This item is imported. Please note, colors may appear differently in different resolutions and on different computers. Made by VHC Brands. Manufacturer's UPC code is 840528125096. The Charlotte Solid Natural Scalloped Short Panel Set of 2 is made of a grey/beige color luxurious linen/cotton blend known as “Belgium weight” meaning equal parts cotton and linen. Scalloped hem with self binding trim. Sides are .75" hem fold. Features 2" header and 3.25" rod pocket. Includes 2 matching tie-backs. Each panel measures 63" x 36". Lined with white cotton. This item is imported. Please note, colors may appear differently in different resolutions and on different computers. Made by VHC Brands. Manufacturer's UPC code is 840528124495. The Charlotte Azure Scalloped Panel Set of 2 has stenciled azure blue pencil stripes printed on a luxurious linen/cotton blend known as “Belgium weight” meaning equal parts cotton and linen in grey/beige. Scalloped hem with bias cut stripe binding trim. Sides are .75" hem fold. Features 2" header and 3.25" rod pocket. Includes 2 matching tie-backs. Each panel measures 84" x 40". Lined with white cotton. This item is imported. Please note, colors may appear differently in different resolutions and on different computers. Made by VHC Brands. Manufacturer's UPC code is 840528125089. The Charlotte Slate Scalloped Panel Set of 2 has stenciled slate grey pencil stripes printed on a luxurious linen/cotton blend known as “Belgium weight” meaning equal parts cotton and linen in grey/beige. Scalloped hem with bias cut stripe binding trim. Sides are .75" hem fold. Features 2" header and 3.25" rod pocket. Includes 2 matching tie-backs. Each panel measures 84" x 40". Lined with white cotton. This item is imported. Please note, colors may appear differently in different resolutions and on different computers. Made by VHC Brands. Manufacturer's UPC code is 840528124884. The Charlotte Solid Natural Scalloped Panel Set of 2 is made of a grey/beige color luxurious linen/cotton blend known as “Belgium weight” meaning equal parts cotton and linen. Scalloped hem with self binding trim. Sides are .75" hem fold. Features 2" header and 3.25" rod pocket. Includes 2 matching tie-backs. Each panel measures 84" x 40". Lined with white cotton. This item is imported. Please note, colors may appear differently in different resolutions and on different computers. Made by VHC Brands. Manufacturer's UPC code is 840528124488. The Charlotte Azure Scalloped Tier Set of 2 has stenciled azure blue pencil stripes printed on a luxurious linen/cotton blend known as “Belgium weight” meaning equal parts cotton and linen in grey/beige. Scalloped hem with bias cut stripe binding trim. Sides are .75" hem fold. Features 2" header and 3.25" rod pocket. Each panel measures 24" x 36". Lined with white cotton. This item is imported. Please note, colors may appear differently in different resolutions and on different computers. Made by VHC Brands. Manufacturer's UPC code is 840528125133. The Charlotte Solid Natural Scalloped Tier Set of 2 is made of a grey/beige color luxurious linen/cotton blend known as “Belgium weight” meaning equal parts cotton and linen. Scalloped hem with self binding trim. Sides are .75" hem fold. Features 2" header and 3.25" rod pocket. Each panel measures 24" x 36". Lined with white cotton. This item is imported. Please note, colors may appear differently in different resolutions and on different computers. Made by VHC Brands. Manufacturer's UPC code is 840528124532. The Charlotte Azure Scalloped Tier Set of 2 has stenciled azure blue pencil stripes printed on a luxurious linen/cotton blend known as “Belgium weight” meaning equal parts cotton and linen in grey/beige. Scalloped hem with bias cut stripe binding trim. Sides are .75" hem fold. Features 2" header and 3.25" rod pocket. Each panel measures 36" x 36". Lined with white cotton. This item is imported. Please note, colors may appear differently in different resolutions and on different computers. Made by VHC Brands. Manufacturer's UPC code is 840528125140. The Charlotte Slate Scalloped Tier Set of 2 has stenciled slate grey pencil stripes printed on a luxurious linen/cotton blend known as “Belgium weight” meaning equal parts cotton and linen in grey/beige. Scalloped hem with bias cut stripe binding trim. Sides are .75" hem fold. Features 2" header and 3.25" rod pocket. Each panel measures 36" x 36". Lined with white cotton. This item is imported. Please note, colors may appear differently in different resolutions and on different computers. Made by VHC Brands. Manufacturer's UPC code is 840528124945. The Charlotte Solid Natural Scalloped Tier Set of 2 is made of a grey/beige color luxurious linen/cotton blend known as “Belgium weight” meaning equal parts cotton and linen. Scalloped hem with self binding trim. Sides are .75" hem fold. Features 2" header and 3.25" rod pocket. Each panel measures 36" x 36". Lined with white cotton. This item is imported. Please note, colors may appear differently in different resolutions and on different computers. Made by VHC Brands. Manufacturer's UPC code is 840528124549. The Charlotte Blue Rug reflects European charm in its simplicity with blue grain sack stripes on a natural cotton rib weave. The ends feature hand-tied, 3” tassels for a relaxed look. The back has a latex spray to reduce slippage. Measures 20" x 30". This item is imported. Please note, colors may appear differently in different resolutions and on different computers. Made by VHC Brands. Manufacturer's UPC code is 840528125874. The Charlotte Blue Rug reflects European charm in its simplicity with blue grain sack stripes on a natural cotton rib weave. The ends feature hand-tied, 3” tassels for a relaxed look. The back has a latex spray to reduce slippage. Measures 27" x 48". This item is imported. Please note, colors may appear differently in different resolutions and on different computers. Made by VHC Brands. Manufacturer's UPC code is 840528125881. The Charlotte Blue Rug reflects European charm in its simplicity with blue grain sack stripes on a natural cotton rib weave. The ends feature hand-tied, 3” tassels for a relaxed look. The back has a latex spray to reduce slippage. Measures 36" x 60". This item is imported. Please note, colors may appear differently in different resolutions and on different computers. Made by VHC Brands. Manufacturer's UPC code is 840528125898. The Charlotte Blue Rug reflects European charm in its simplicity with blue grain sack stripes on a natural cotton rib weave. The ends feature hand-tied, 3” tassels for a relaxed look. The back has a latex spray to reduce slippage. Measures 48" x 72". This item is imported. Please note, colors may appear differently in different resolutions and on different computers. Made by VHC Brands. Manufacturer's UPC code is 840528125904. The Charlotte Blue Rug reflects European charm in its simplicity with blue grain sack stripes on a natural cotton rib weave. The ends feature hand-tied, 3” tassels for a relaxed look. The back has a latex spray to reduce slippage. Measures 60" x 96". This item is imported. Please note, colors may appear differently in different resolutions and on different computers. Made by VHC Brands. Manufacturer's UPC code is 840528125911.